Find out the trick below to sticking to your New Years resolutions, so you can start improving your life right now. Now that a new year is about to come along our minds stray to the resolutions we want to keep this year, about how to improve our lives in some way for the better. While there is nothing wrong, and actually many things right about the urge for self-improvement, sometimes the resolutions we make actually keep us from positive change, instead of bringing that change about. The reason for this is that most of the time we set ourselves up for failure when we make our New Years resolutions at the beginning of each year. In fact, according to Tom Connellan, the author of The 1% Solution , 88% of people, the vast majority, fail to keep their New Years resolutions. When we don't stick to our resolutions that can lead to a sense of failure which makes us feel bad about ourselves, and actually makes it harder to achieve self-improvement. It can become a nasty cycle. Here are some secrets for how to stick to our resolutions, and really start some meaningful change in our lives. But before I explain what kinds of resolutions are best to make, let's talk about those which are almost always doomed to fail so you don't make those mistakes again this year. There are two broad types of resolutions that set you up for failure -- unrealistic ones, and overly broad ones. Unrealistic resolutions are those, such as vowing never to eat a certain food, like chocolate, ever again. If you eat just one little sliver of chocolate you have basically "failed" and so you tend to think you might as well just eat a big box of chocolate with Hershey's syrup on top. The other category of resolutions that set you up for failure is even more common than the unrealistic ones -- they are the overly broad ones. When you make a New Years resolution, such as to "get organized" or "lose weight" those are really broad statements. To make those statements become a reality you need to make many different changes in your life, take many different steps, and they may also take quite a bit of time to achieve. 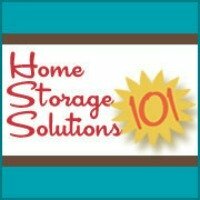 If you are interested in getting your home organized you can check out my 52 Week Organized Home Challenge on Home Storage Solutions 101, which lists actionable steps you can take each week to actually acheive this goal! You are unlikely, with broad resolutions, to see results all of a sudden and all at once. Again, this makes you feel like a failure which actually makes you feel worse and makes the problems worse, generally. Now, this article promised to teach you how to stick to your New Years resolutions, so at this point you may be feeling a bit discouraged. However, once you decide the area in your life that needs improvement a little extra thought, lots of patience, and some changes in what you mean by "resolution" can help you achieve the goals you set for yourself. The classic idea of a New Years resolution is one of instant change. For example, in our minds the idea was that on December 31st we may be an unorganized person, but we will change our ways on January 1st and suddenly become organized, literally overnight, just through sheer willpower. Pyschological study after study has shown that this is just not possible since all humans are creatures of habit. Some of our habits are positive, some of them negative, but we are where we are and cannot instantly change ourselves, overnight. Instead, we must change our negative habits. Unfortunately, our minds rebel against change, even change that is good for us. Therefore, you can't change, successfully, more than one habit at a time. This means the process of positive change can feel very slow, but changing one habit a month is about the max you can do. So, to stick to your New Years resolutions you need to make these resolutions one small positive habit at a time, perhaps with the habits building upon one another to reach a broader goal through a slow process of change over time. It is that simple, and at the same time that hard to stick to your resolutions. This site is dedicated to the concept of learning how to manage your home and family, to have a smooth running home that you and your family are glad to live in together. My hope is for each of us to have a home and family life we enjoy. To that end I have been thinking about the habits we need to cultivate in our own lives to make that hope -- or New Years resolution, if you will -- a reality. Below I have listed what I believe are the 12 core concepts in household management that I plan to discuss this year, one each month. If we begin to incorporate these ideas and habits into our lives each day they will bring us closer to reaching our ultimate goal of a smooth running and happy home. The plan is that each month I will have some articles focused on the habit or core principle of the month, which I will post on the site. It is tempting to try to start doing all these core principles at once, but I just don't think it will work for any of us. We have to learn one set of skills before we move onto the next. Obviously, don't quit anything you're already doing well, but don't feel compelled to do all these things at once if you're not doing them already. Slow and steady wins the race. 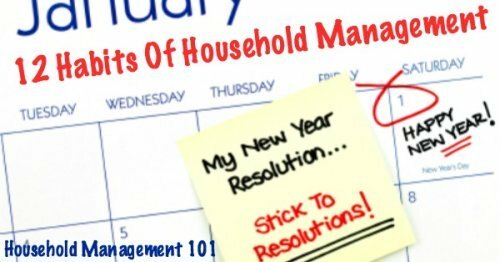 January - Time management techniques for moms, including the ideas of creating habits, schedules, routines, planning, and goal seting. February - Taking stuff out of your "Mommy brain" and writing down your ideas, plans, schedules and routines in your household notebook, and start using a family calendar. March - Get a handle on cleaning, laundry and chores in your house, including getting your whole family (including kids) involved in the process. (I have a site devoted to the how to's of these topics called Stain Removal 101 if you need practical help with a specific topic. But here we'll also focus on making cleaning, laundry, etc. a habit so it's not so overwhelming. April - Work on home organization, decluttering and storing all your possessions to be able to get to things when you need them. This includes the habit of tidying your home as you move throughout your day. May - Meal planning basics to feed your family well, even on budget, along with grocery shopping and cooking. In addition, incorporate the habit of having dinner and any other meals possible together, as a family. June - Make a budget for your household and stick to it, to help you save money and still live well. Incorporate as many money saving strategies as fit into your lifestyle and time commitment level, including couponing, frugal and simple living, etc. July - Begin thinking about some of the basic financial planning issues your family needs to consider, including home and life insurance, creating a will, and that other grown up stuff that is no fun, but needs to get done. August - Creating a healthy and safe home for your family. September - Making your house into a home, from decorating ideas and home maintenance, to just making sure everyone feels loved and comfortable in your home. October - Making time for family fun activities with your kids, as well as facilitating learning for them. November - Taking care of yourself, and finding balance between fulfilling other people's needs, and your own. December - Enjoying your family and friends, with a focus on entertaining, holidays and celebrations. 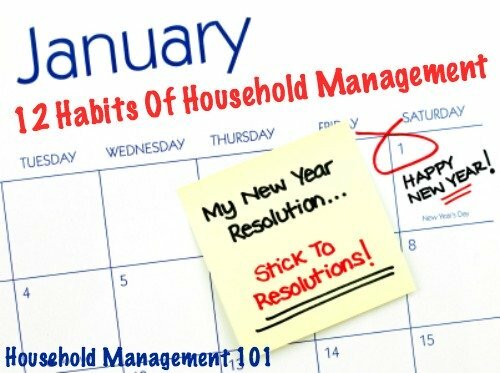 I will be working on all these habits and concepts myself over the next year, and I would love it if you joined me if improving your household management skills is one of your New Years resolutions too! Good luck with whatever resolution you have chosen for yourself. Just remember -- small incremental changes in habits can lead to amazing results!